1Heart Center, Segeberger Kliniken GmbH, Bad Segeberg, Germany.2Department of Electrophysiology, Heart Center, Leipzig, Germany. Catheter ablation of atrial fibrillation has evolved enormously thanks to rapid improvement of modern mapping technologies, progress in catheter development and current possibilities for reduction of radiation exposure. Pulmonary vein isolation is thereby the cornerstone in this interventional treatment. Increased precision of catheter localization by modern three-dimensional mapping systems, faster and better processing of local electrograms and their immediate color-based visualization make it possible to treat even challenging arrhythmias very effectively. The commonly used three-dimensional mapping systems CARTO 3 (Biosense Webster, Irvine, Ca.) and Ensite Precision (St. Jude Medical, St. Paul, Min) differ in construction and principles of the underlying mapping technology. In this review article, we aim to emphasize the most important aspects of possibilities that make both systems so valuable for interventional treatment of atrial fibrillation. 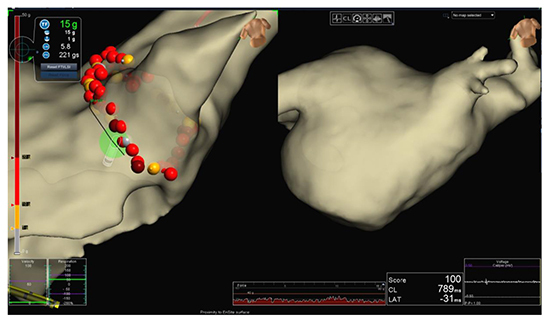 We present a modern workflow, that unites three-dimensional LA mapping with collecting relevant local information, image integration for refining the map and beneficial use of contact force based ablation approach. Key Words : Atrial Fibrillation, 3D Mapping, PVI, Geometry. Correspondence to: Philipp Sommer Department of Electrophysiology, Heart Center, University of Leipzig, Struempellstr. 39, Leipzig, Sachsen, 04289, Germany. CARTO 3 is the third-generation electroanatomical mapping system from Biosense Webster and is currently available with the latest software version 6. The system consists of a locator pad with three separate low-level magnetic field emitting coils (5x10-6 to 5x10-5 tesla) being arranged as a triangle under the patient, 6 body patches, a mapping catheter with embedded magnetic location sensors in its tip, a data processing unit and a graphic display unit to provide visualization of the electroanatomical model being created. The nonfluoroscopic CARTO system uses hybrid magnetic and current-based measurement to allow precise catheter location inside the heart with an accuracy of less than 1 mm. The CARTO system generates a real-time map by processing the local electrograms and spatial information at the catheter tip, while the catheter is precisely localized by using a triangulation algorithm similar to the principle function of GPS technology. The magnetic field emitter under the catheter table serves this purpose. Three different electromagnets generate three low-intensity magnetic fields. The metal tip of the catheter moves through these fields and generates an electrical current depending on the strength of the magnetic field and orientation of the catheter tip in it. This allows calculation of the distance from catheter tip to each of the three electromagnets (Figure 1A). This calculation adjusts the current-based information generated by the system by sending a small current across a catheter electrode which is then registered via the six body patches and become evaluated. Each electrode emits current at their own unique frequency. For each coordinate, a current ratio is created by measurement of the current strength at each patch and stored by the system for adjustment with the magnetic-based data. In addition to this information, three orientation determinants are detected by the system: yaw, roll and pitch (Figure 1B). The illustrated catheter tip on the display screen presents these 6 degrees of freedom with an additional 4-color-information indicating the current position, rotation and deflection of the catheter and its movement in real time. This supports precise catheter navigation in the heart chamber. The accuracy of the catheter position must be maintained despite the artifacts caused by respiration, patient movement, cardiac activity, and system movement. Therefore, three of six body patches (back patches) are used along with the locator pad for the location reference as part of the Body Coordinate System. Attached to the patients back they constitute a fixed point in space and allows the system to measure the catheters location relative to this reference point for compensation of patient and system movement. Inter-patch-communication via measurement of impedance changes between the back and chest patches are mainly used for compensation of respiratory motion. The 6 patches also contain magnetic sensors for localization. Additional respiratory information which can be recorded via the ACCURESP module support the calculation. For elimination of artefacts caused by cardiac motion, the system uses the electrical reference to match the coordinates of points with the time in cardiac cycle by point-by-point-mapping. For Fast Anatomical Mapping (FAM) the coordinates are adjusted but averaged leading to stable catheter visualization. The CARTO mapping system is used with deflectable uni- or bidirectional therapeutic catheters of Biosense Webster only which are available in three sizes: 4 mm, 8 mm (solid tips) and 3,5 mm (irrigated tip) and different deflection curves. Therapeutic open irrigated catheters are also available with enhanced surround flow (SF) technology allowing reduction of fluid for cooling process without trade-offs between power and signal resolution. A variety of diagnostic catheters allow the examination of intracardiac signals, adapted to the respective arrhythmia. Diagnostic catheters of other manufacturers can be partially used with CARTO system by using a special connector. Compared to previous models the CARTO 3 system allows visualization of up to 5 catheters at the same time with and without magnetic sensors and provide technology for rapid creation of the three-dimensional map (FAM: Fast Anatomical Mapping) while minimizing the need for radiation exposure. Volume data collection via FAM speeds up the creation of a map compared to point by point mapping. The simultaneous creation of high-density maps with simultaneous acquisition of anatomy, voltage and local activation data (if active) allow rapid mapping while collecting the relevant local data from the endocardium while the arrhythmia is present. Besides activation map, isochronal map, propagation map, entrainment map and voltage map the system has been enhanced with the new option of ripple mapping in the current software version 6. Ripple mapping is independent on mapping annotation and window of interest and allows simultaneous activation and voltage analysis. This additional information is useful for treating challenging arrhythmias, such as atypical atrial flutter caused by local reentry with complex wavefront propagation. For high density mapping and simultaneous acquisition of multiple electrograms and their voltage and activation information, Biosense Webster provide the PentaRay catheter with 20-poles arranged in 5 flexible radiating splines that covers an area with a diameter of 3,5 mm. Thus, the system is prepared for the rapid and accurate three-dimensional mapping of the left atrium including the pulmonary vein ostia. During the mapping process, the voltage can be displayed to obtain a fast overview of the atrial fibrosis. The additional tools mentioned above allow the rapid mapping of the LA geometry and allow colour-based visualization of excitation process and wavefront direction during atrial arrhythmia if necessary. The EnSite Precision Cardiac Mapping System, which is available since 2016, also uses the advantages of hybrid impedance and magnetic field technology for localization of the catheters insight the body. It allows a much higher precision and more accuracy over the entire investigation time compared to the predecessors EnSite NavX and Ensite Velocity. The system consists of the following components: the EnSite Amplifier (which converts the physiological signals from the patients to digital signals for processing by the workstation), the EnSite Precision Field Frame, the display workstation and eight surface electrodes (three transthoracic pairs for three orthogonal axes and two patient reference sensors). It is, compared to the CARTO system, an open platform with compatibility to almost any electrophysiology catheter for mapping cardiac chambers. The basis for impedance-based localization and tracking of the catheters is the proven EnSite NavX Navigation and Visualization technology of previous EnSite systems. The new hardware equipment allows the additional use of the new Sensor EnabledTM (SE) technology. The therefore necessary EnSite Precision field frame is (like the location pad of the CARTO system) attached under the catheter table and generates a weak magnetic field. 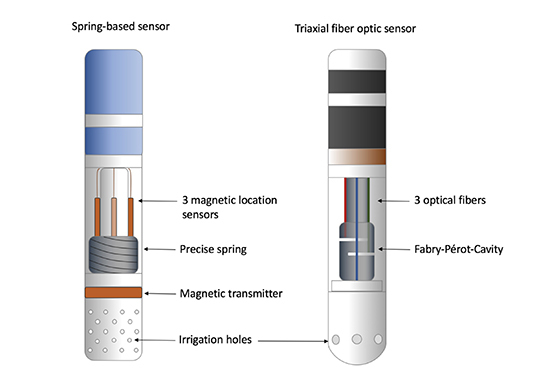 Sensor Enabled equipped catheters can be additionally located in the magnetic field. This information is used to refine the impact-based location, especially in the peripheral areas. This impedance-based location is based on the following principle: the previous described surface electrodes serve to generate an impedance field. An 8-kHz signal is sent alternately through each of the three pairs of transthoracic patches. Thus, a voltage gradient is generated in the x, y and z axis. The electrodes of the respective catheter, which enters this voltage field, measures the voltage, adjusted to the gradient generated by the 8 kHz signal in the respective axis. The location of each electrode can be calculated in the three-dimensional space. To use the magnetic data, a catheter with Sensor Enabled technology is necessary. The EnSite Precision system uses the magnetic data for real time adjustment of the impedance based catheter localization. Additionally, this information is meaningful for the EnSite stability monitor to preserve the localization accuracy in case of unexpected changes of the impedance field. This leads to an navigation accuracy of < 1 mm. For creation of left atrial geometry, the Advisor FL can be used as SE capable circular mapping catheter. For ablation, both the FlexAbility catheter (without Contact Force) and the TactiCath Quartz (with Contact Force) are offered. Automation tools like EnSite AutoMap reduce the mapping time and also provide the possibility to create an additional map besides recording the anatomy, e.g. a voltage map. The new TurboMap feature allows very fast processing of stored procedure data and works similar to the CARTO Replay module. The EnSite Automark module represents an automated lesion creating tool according to predefined criteria. Figure 2. Electroanatomical reconstruction of the left atrium and fusion with CT data set (left) and MRI data set (right) for pulmonary vein isolation. This demonstrates that both cardiac mapping systems allow a very precise and stable three-dimensional reconstruction of the left atrium and provide numerous additional tools that allow the user to target even complex atrial arrhythmias. Figure 3. Illustration of an AF ablation with contact force technology. Ablation with contact force of 15 g at the bottom of RIPV is shown in the left picture. The corresponding MRI image, which is displayed in a synchronized mode, is visualized on the right side. The use of CT or MRI data sets created prior to study initiation is becoming increasingly common in clinical practice. These data sets are processed so that the atrial anatomy can be represented three-dimensionally with high accuracy. This allows the visualization of anatomical peculiarities that might not have been noticed in a single three-dimensional mapping approach. The virtual 3D model either serves for sole orientation in the left atrium during the electroanatomical mapping process or can be fused with the generated map. The accurate reconstruction of difficult areas of the atrium such as the ridge between the left upper vein and the left atrial appendage improves catheter navigation and visualization of tissue contact during the actual ablation procedure. Efficacy studies currently show no reliable benefit of image integration regarding recurrence rate after ablation of atrial fibrillation. For the CARTO system, the necessary module is entitled CARTOMERGE. It improves the realistic appearance of the left atrium by providing additional important patient-specific anatomical information. After mapping the atrium, the system can fuse CT/MRI data set with the electroanatomical map after selecting corresponding fiducial points on the CT/MRI map and the created map. The module calculates the ideal fusion of both 3D models. The accuracy of the fusion can be checked by moving the ablation catheter through the atrium and check whether the visualization of the catheter tip projection is adequately displayed while having good local tissue contact. The module helps to guide ablation process with improved procedure safety and efficacy . Another recently released module, the CARTOSeg CT module provides a semi-automatic segmentation function with separating the atria, the ventricles, esophagus and coronary sinus as well as the aorta without additional user-dependent identification. It automates the CT segmentation before it is used as data set for image integration and thus speeds up the workflow. For generating a detailed 3D map it is also possible to combine the electroanatomical map with a map derived from echocardiographic information from real time intracardiac echocardiography (ICE) which in turn is created through combining multiple ECG-gated 2D ultrasound cross sections generated from an ultrasound transducer. This ICE data can be processed via the CARTOSound image integration module . For this purpose, each image is automatically optimized in terms of contrast and frequency, and the endocardial wall side is detected based on different echo intensity between blood and tissue. The special SOUNDSTAR catheter from Biosense Webster provides besides the ultrasonic beam an embedded magnetic location sensor for accurate localization in the left atrium. 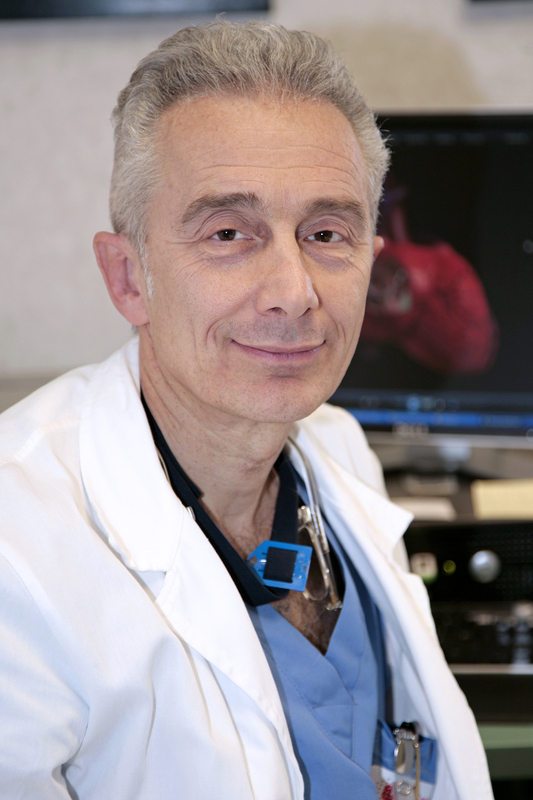 The CARTOUnivu module is the technology that allows physicians to interlock a static fluoroscopic image with the current three-dimensional map after prior registration. Similarly, dynamic sequences, such as coronary angiography, can be merged with the map. This provides valuable additional information such as distance from ablation side to coronary vessels and reduce the radiation exposure for the patient and the entire staff. It is also possible to automatically integrate the static or dynamic sequence in a 180-degree rotated map after appropriate calculation by the CARTO system. Using the CARTOUnivu module the fluoroscopy time as well as the fluoroscopy dose can significantly be reduced in an AF ablation procedure without prolongation of procedure time or differences of periprocedural complications or acute ablation success rates. The EnSite precision system provide the EnSite Verismo Segmentation Tool to allow segmentation and three-dimensional reconstruction of cardiac models from 2D slice-based CT/MRI data. The fusion of the electroanatomical map and the CT/MRI images is done by EnSite Fusion Registration module. In a split screen the real-time geometry is visualized on the left side (with field scaling) and the 3D reconstruction from the CT/MRI data set on the right side. In this step, gross deviations in the map can be improved. The fusion of the two 3D reconstructions is initially done by rigid fusion through three fiducial corresponding points. These fiducial points should be placed at positions that are clearly traceable in both maps. In another dynamic fusion step, both maps will be adjusted by further fiducial points to increase the accuracy significantly. In contrast to the CARTOMerge software, the geometry is hereby tugged and compressed locally to align with the CT / MRI surface. So, besides shifting and rotation in three axes, this stretching increases the fusion accuracy through additional fiducial points. The CARTOMerge software only provides shifting and rotation in three axes without relevant resulting differences in registration error. The Fusion module also allows a variety of map types which can be displayed, for instance voltage or activation map. Figure 4. Left: 3D reconstruction of the left atrium with EnSite Precision. Image integration of MRI data and fusion of both maps with EnSite Fusion. Additional voltage information is seen from an PA view. Right: 3Dreconstruction of the left atrium (MRI data) and integrated fluoroscopic image with CARTOUnivu. The non-fluoroscopic catheter tracking system MediGuide is a technology for reduction of radiation exposure during an ablation procedure. With the use of a low-powered electromagnetic field around the patient, catheters with embedded sensors can be located and tracked with an accuracy of 1 mm and 1° on prerecorded 2D x-ray images and loops. The electromagnetic field emitter is integrated in the fluoroscopic detector. The patient receives a reference sensor on the back. Together with the ECG signals it is possible to compensate artifacts caused by movement of the patient and respiration. Using MediGuide for ablation of atrial fibrillation has been proven to be safe and efficient and accompanied with significant reduction of fluoroscopy time. Homogeneous transmural antral lesion formation in treatment of atrial fibrillation without interlesion space is the fundamental requirement for stable pulmonary vein isolation to achieve long-term freedom of AF recurrence by avoiding electrical reconnection of the pulmonary veins. Thus, long-term success rates up to 80% can be achieved with multiple procedures. Sufficient tissue contact ensures adequate energy delivery. Force sensing technologies have been established as valuable part of AF ablation procedure in the last years. The feedback of contact force information also avoids excessive energy transfer to the tissue resulting in risk of overheating, tissue perforation and fistulae. Omitting robotic navigation there are two contact force catheters currently available on the market: the TactiCath Quartz (St. Jude Medical) and the ThermoCool SmartTouch (Biosense Webster) irrigated tip catheter. Both catheters differ in structure and thus in type of contact force measurement (Figure 5). Figure 5. Illustration of principle construction of both catheters, the Thermocool SmartTouch SF (left) and TactiCath Quartz (right) with fundamental differences in contact force assessment. The 3.5 mm irrigated tip TactiCath catheter consists of one thermocouple for temperature measurement at the catheter tip, 6 irrigation holes with 0.4 mm diameter and the contact force sensor. This fiberoptic sensor is made up of 3 optical fibers, which are aligned in parallel and directed towards an elastic polymer layer. By deformation of the membrane upon tissue contact, the wavelength of the reflected infrared laser light is changed, which in turn correlates with the strength and angle of the applied force. The principle of measurement is based on a Fabry-Pérot-Cavity. The axial and lateral CF can be measured and displayed. The ThermoCool SmartTouch (SF) catheter is also a 3.5 mm irrigated tip catheter. The CF is measured here via a small precise spring being located in the catheter shaft. The CF calculation is based on the measurement of the distance between the magnetic transmitter coil (distal of the spring) and the 3 location sensors (proximal of the spring) with a known spring constant. Contact force and direction is measured in an interval of 50 ms and is displayed as averaged CF every second on screen. With this catheter, the CF should be zeroed in the blood. The accuracy of the force measurement is not influenced by the angle of the acting force in the TactiCath Quartz catheter with triaxial fiber optic sensor technology. Axial and lateral forces deform the gratings of the deformable body and recently published data demonstrate the high accuracy of CF measurement for both axial and lateral forces . In particular, very laterally acting forces, especially on proximal portions of the catheter tip, lead to an underestimation of CF forces in Smarttouch catheters with their spring-based sensor technology. Moreover, the TactiCath Quartz catheter shows significantly higher accuracy of CF measurement in both perpendicular and lateral orientations to the tissue compared to the Smarttouch catheter (1.2 g vs. 6.0 g mean absolute difference, 5 g vs. 30 g maximum error). This difference in technology has to be kept in mind at ablation sites with a parallel orientation to the tissue. After Shah et. al. in 2010 had demonstrated in vitro that additional delivery of contact force information during ablation directly correlates with lesion depth and size over time , the TOCCATA trial provided the first evident clinical data of safety and efficacy of a novel contact force catheter (TactiCath) based ablation in treatment of atrial fibrillation. With lesions generated with at least 10 g of CF, AF freedom in 80% of patients could be achieved after 12 months . Two years later in 2014, it could be proven for this catheter that stable contact force (CF) during radiofrequency ablation was crucial for the significantly higher success rate (freedom of atrial tachycardia after 1 year) in patients with drug refractory paroxysmal atrial fibrillation . In 2015, evidence was provided that the use of a TactiCath catheter is also noninferior to a catheter without CF technology (Navistar Thermocool, Biosense Webster) and that optimal CF guided ablation (>90% of points with >10 g CF) improve 12 months’ outcome (freedom of any atrial arrhythmia recurrence) in patients with paroxysmal atrial fibrillation. The EFFICAS I (2013) and EFFICAS II (2015) trials taught us that at least 10 g of pressure should be applied at each ablation site, but on average 20 g should be the target for achieving rapid transmurality of the lesion. On the other hand, it is important to avoid excessive tip-tissue contact and high energy applications so as not to endanger the safety of the patient. Makimoto et al. could recently show that gradual impedance rise (> 5 / 10 seconds) after 20 seconds of RF ablation with high CF and high applied power may be caused by charring at the catheter tip. This impedance rise can be avoided by using CF below 27 g (negative predictive value of 95 %). We still have not yet been able to obtain perfect information on the transmurality of a lesion, its homogeneity, size and shape and thus to be sure that this lesion is irreversibly electrically inactive. Nevertheless, in recent years we have succeeded in getting closer to this concern. We know that contact force, catheter stability, RF power, interlesion space and anatomy of the local tissue site are important parameters for getting a good lesion. Several indices were developed and tested for this purpose and currently provide a feedback about lesion quality. The first of these was the Force Time Integral (FTI) presented by Prof. Shah 2010. The TOCCATA study in 2012 provided the first clinical evidence that the FTI is an independent predictor of outcome after ablation of atrial fibrillation. The EFFICAS I and II trials showed us that at least 400 gs should be achieved at a local tissue site with CF > 20 g on average (range 10-30 g) and lesion index (LSI) > 5 (lesion index also considers applied power) for avoiding PV reconnection after AF ablation with a 95% probability of durable PV isolation after 3 months. The Force Time Integral (FTI) and Lesion Index (LSI) are calculated and displayed using the EnSite Contact Force module in EnSite systems. A recent index that also takes the non-linear relationship between CF and application time into account is the Ablation Index (AI). The CARTO VISITAG module enables the calculation of the Ablation Index based on a logarithmic formula which includes the CF, the applied power and its duration. Recently published data demonstrate the clinical benefit of using AI. Hussein et al. could show, that using the Ablation Index (400 for posterior and inferior wall segments and 550 for anterior and roof segments of LA) leaded to higher rate of first pass PV isolation, lower incidence of acute and long term (12 months) PV reconnection and higher impedance drop suggesting better lesion quality. The control group was treated with standard CF-guided ablation approach. Contrary to the single FTI target value, the AI target value depends on the LA region based on different wall thickness. The latest featured index is the Ablation Line Contiguity Index (ALCI) as a novel automated algorithm combining depth and contiguity (FTI, AI and ILD) into one single criterion and is defined as the ratio of the estimated width of 2 neighboring lesions over their interlesion distance. The interlesion distance (ILD) is the distance between neighboring RF lesions on the circumferential ablation line. The ILD in one segment is predictive of local PV reconnection. The study results suggest an ILD target of < 5 mm . A multicenter study will investigate the clinical benefit of the ALCI. A good quality of lesion on the entire antral line around the pulmonary veins is of crucial importance for the clinical outcome of our patients. The contact force technology and the use of lesion assessment tools are elementary components of a modern ablation strategy. MB, LI, KK and IP have no conflicts to declare. GH and PS received research grants from Abbott Medical and are advisory board members of Abbott Medical and Biosense Webster. Modern cardiac mapping systems provide a very precise three-dimensional resolution of the left atrium, which is essential for efficient and safe treatment of atrial fibrillation. Image integration tools refine the geometry, do not require relevant effort and should be part of a modern LA reconstruction. They also ensure a significant reduction in radiation exposure for the patient, the investigator and the entire staff. Several mapping tools offers fast and high-resolution visualization of relevant electrical information and therefore enable us to treat even complex arrhythmia. Innovative mapping features like ripple mapping increasingly automate the mapping process and improved catheter development with contact force technology together with lesion assessment tools are an essential part of modern AF ablation approach and therefore should be incorporated into our workflow. The fundamental differences in contact force assessment of the 2 available systems has to be kept in mind. Liu Shan-Xin, ZhangYu, ZhangXing-Wei. Impact of image integration on catheter ablation for atrial fibrillation using three-dimensional electroanatomic mapping: a meta-analysis. Pacing Clin Electrophysiol. 2012;35 (10):1242–7. Della Bella Paolo, FassiniGaetano, CiredduManuela, RivaStefania, CarbucicchioCorrado, GiraldiFrancesco, MaccabelliGiuseppe, TrevisiNicola, MoltrasioMassimo, PepiMauro, GalliClaudia A, AndreiniDaniele, BalleriniGiovanni, PontoneGianluca. Image integration-guided catheter ablation of atrial fibrillation: a prospective randomized study. J. Cardiovasc. Electrophysiol. 2009;20 (3):258–65. Imanli Hasan, BhattyShaun, JeudyJean, GhzallyYousra, UmeKiddy, VunnamRama, ItahRefael, AmitMati, DuellJohn, SeeVincent, ShorofskyStephen, DickfeldTimm M. Validation of a novel CARTOSEG™ segmentation module software for contrast-enhanced computed tomography-guided radiofrequency ablation in patients with atrial fibrillation. Pacing Clin Electrophysiol. 2017;40 (11):1206–1212. den Uijl Dennis W, TopsLaurens F, TolosanaJosé M, SchuijfJoanne D, TrinesSerge A I P, ZeppenfeldKatja, BaxJeroen J, SchalijMartin J. Real-time integration of intracardiac echocardiography and multislice computed tomography to guide radiofrequency catheter ablation for atrial fibrillation. Heart Rhythm. 2008;5 (10):1403–10. Singh Sheldon M, HeistE Kevin, DonaldsonDavid M, CollinsRyan M, ChevalierJianping, MelaTheofanie, RuskinJeremy N, MansourMoussa C. Image integration using intracardiac ultrasound to guide catheter ablation of atrial fibrillation. Heart Rhythm. 2008;5 (11):1548–55. Christoph Marian, WunderlichCarsten, MoebiusStefanie, ForkmannMathias, SitzyJudith, SalmasJozef, MayerJulia, HuoYan, PiorkowskiChristopher, GasparThomas. Fluoroscopy integrated 3D mapping significantly reduces radiation exposure during ablation for a wide spectrum of cardiac arrhythmias. Europace. 2015;17 (6):928–37. Sommer Philipp, RolfSascha, PiorkowskiChristopher, GasparThomas, HuoYan, PiedraCarlos, RichterSergio, BollmannAndreas, AryaArash, HindricksGerhard. Nonfluoroscopic catheter visualization in atrial fibrillation ablation: experience from 375 consecutive procedures. Circ Arrhythm Electrophysiol. 2014;7 (5):869–74. Ganesan Anand N, ShippNicholas J, BrooksAnthony G, KuklikPawel, LauDennis H, LimHan S, SullivanThomas, Roberts-ThomsonKurt C, SandersPrashanthan. Long-term outcomes of catheter ablation of atrial fibrillation: a systematic review and meta-analysis. J Am Heart Assoc. 2013;2 (2):–. Panda Nikhil C, CheungJim W. Complications from catheter ablation of atrial fibrillation: impact of current and emerging ablation technologies. Curr Treat Options Cardiovasc Med. 2014;16 (10):–. Ikeda Atsushi, NakagawaHiroshi, LambertHendrik, ShahDipen C, FonckEdouard, YulzariAude, SharmaTushar, PithaJan V, LazzaraRalph, JackmanWarren M. Relationship between catheter contact force and radiofrequency lesion size and incidence of steam pop in the beating canine heart: electrogram amplitude, impedance, and electrode temperature are poor predictors of electrode-tissue contact force and lesion size. Circ Arrhythm Electrophysiol. 2014;7 (6):1174–80. Lin Tina, OuyangFeifan, KuckKarl-Heinz, TilzRoland. THERMOCOOL® SMARTTOUCH® CATHETER - The Evidence So Far for Contact Force Technology and the Role of VISITAG™ MODULE. Arrhythm Electrophysiol Rev. 2014;3 (1):44–7. Bourier Felix, GianniCarola, DareMatthew, DeisenhoferIsabel, HesslingGabriele, ReentsTilko, MohantySanghamitra, TrivediChintan, NataleAndrea, Al-AhmadAmin. Fiberoptic Contact-Force Sensing Electrophysiological Catheters: How Precise Is the Technology?. J. Cardiovasc. Electrophysiol. 2017;28 (1):109–114. Bourier Felix, HesslingGabriele, Ammar-BuschSonia, KottmaierMarc, BuiattiAlessandra, GrebmerChristian, TelishevskaMarta, SemmlerVerena, LennerzCarsten, SchneiderChristine, KolbChristof, DeisenhoferIsabel, ReentsTilko. Electromagnetic Contact-Force Sensing Electrophysiological Catheters: How Accurate is the Technology?. J. Cardiovasc. Electrophysiol. 2016;27 (3):347–50. Shah Dipen C, LambertHendrik, NakagawaHiroshi, LangenkampArne, AebyNicolas, LeoGiovanni. Area under the real-time contact force curve (force-time integral) predicts radiofrequency lesion size in an in vitro contractile model. J. Cardiovasc. Electrophysiol. 2010;21 (9):1038–43. Kuck Karl-Heinz, ReddyVivek Y, SchmidtBoris, NataleAndrea, NeuzilPetr, SaoudiNadir, KautznerJosef, HerreraClaudia, HindricksGerhard, JaïsPierre, NakagawaHiroshi, LambertHendrik, ShahDipen C. A novel radiofrequency ablation catheter using contact force sensing: Toccata study. Heart Rhythm. 2012;9 (1):18–23. Natale Andrea, ReddyVivek Y, MonirGeorge, WilberDavid J, LindsayBruce D, McElderryH Thomas, KantipudiCharan, MansourMoussa C, MelbyDaniel P, PackerDouglas L, NakagawaHiroshi, ZhangBaohui, StaggRobert B, BooLee Ming, MarchlinskiFrancis E. Paroxysmal AF catheter ablation with a contact force sensing catheter: results of the prospective, multicenter SMART-AF trial. J. Am. Coll. Cardiol. 2014;64 (7):647–56. Reddy Vivek Y, DukkipatiSrinivas R, NeuzilPetr, NataleAndrea, AlbenqueJean-Paul, KautznerJosef, ShahDipen, MichaudGregory, WhartonMarcus, HarariDavid, MahapatraSrijoy, LambertHendrik, MansourMoussa. Randomized, Controlled Trial of the Safety and Effectiveness of a Contact Force-Sensing Irrigated Catheter for Ablation of Paroxysmal Atrial Fibrillation: Results of the TactiCath Contact Force Ablation Catheter Study for Atrial Fibrillation (TOCCASTAR) Study. Circulation. 2015;132 (10):907–15. Kautzner Josef, NeuzilPetr, LambertHendrik, PeichlPetr, PetruJan, CihakRobert, SkodaJan, WichterleDan, WissnerErik, YulzariAude, KuckKarl-Heinz. EFFICAS II: optimization of catheter contact force improves outcome of pulmonary vein isolation for paroxysmal atrial fibrillation. Europace. 2015;17 (8):1229–35. Makimoto Hisaki, MetznerAndreas, TilzRoland Richard, LinTina, HeegerChristian-H, RilligAndreas, MathewShibu, LemešChristine, WissnerErik, KuckKarl-Heinz, OuyangFeifan. Higher contact force, energy setting, and impedance rise during radiofrequency ablation predicts charring: New insights from contact force-guided in vivo ablation. J. Cardiovasc. Electrophysiol. 2018;29 (2):227–235. Neuzil Petr, ReddyVivek Y, KautznerJosef, PetruJan, WichterleDan, ShahDipen, LambertHendrik, YulzariAude, WissnerErik, KuckKarl-Heinz. Electrical reconnection after pulmonary vein isolation is contingent on contact force during initial treatment: results from the EFFICAS I study. Circ Arrhythm Electrophysiol. 2013;6 (2):327–33. Kumar Saurabh, ChanMartin, LeeJustin, WongMichael C G, YudiMatias, MortonJoseph B, SpenceSteven J, HalloranKaren, KistlerPeter M, KalmanJonathan M. Catheter-tissue contact force determines atrial electrogram characteristics before and lesion efficacy after antral pulmonary vein isolation in humans. J. Cardiovasc. Electrophysiol. 2014;25 (2):122–9. Hussein Ahmed, DasMoloy, ChaturvediVivek, AsfourIssa Khalil, DaryananiNiji, MorganMaureen, RonayneChristina, ShawMatthew, SnowdonRichard, GuptaDhiraj. Prospective use of Ablation Index targets improves clinical outcomes following ablation for atrial fibrillation. J. Cardiovasc. Electrophysiol. 2017;28 (9):1037–1047. El Haddad Milad, TaghjiPhilippe, PhlipsThomas, WolfMichael, DemolderAnthony, ChoudhuryRajin, KnechtSébastien, VandekerckhoveYves, TavernierRene, NakagawaHiroshi, DuytschaeverMattias. Determinants of Acute and Late Pulmonary Vein Reconnection in Contact Force-Guided Pulmonary Vein Isolation: Identifying the Weakest Link in the Ablation Chain. Circ Arrhythm Electrophysiol. 2017;10 (4):–.